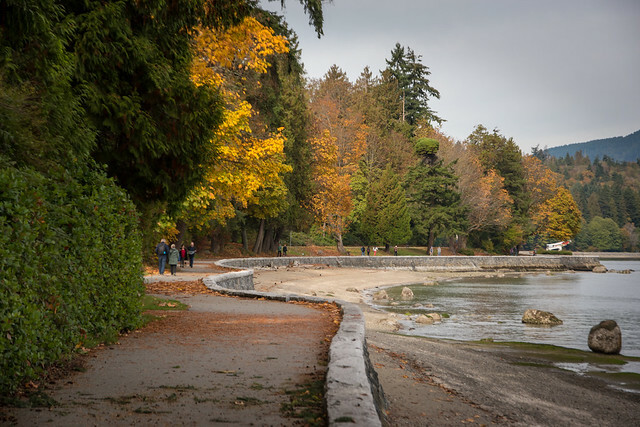 Vancouver’s crown jewel, Stanley Park, is known for its 1,000 acres with forest trails, Lost Lagoon and Beaver Lake, the seasonal miniature railway, the Vancouver Aquarium, and of course its perimeter path, the Seawall. Who doesn’t love the Seawall?! This 64km path that now connects Coal Harbour, to Stanley Park, to False Creek and Kitsilano took the better part of the last century to complete and it’s the world’s longest uninterrupted waterfront path. It gets the love, and it gets the spotlight (especially when you spot an Orca or those adorable harbour seals along the route). But today, I’m going to go back to my blogging roots and be a tourist in my hometown. 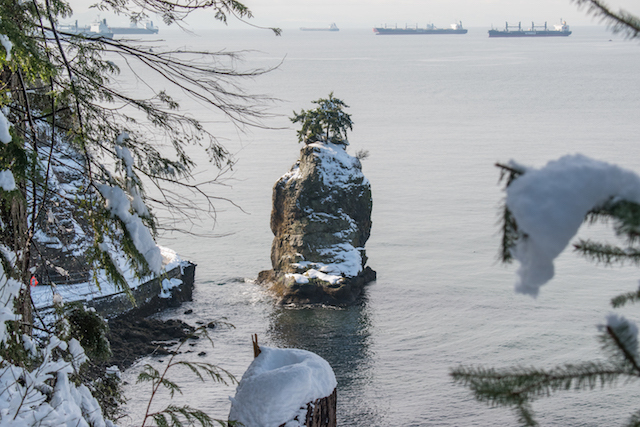 I’m going to tell you about 5 things in Stanley Park that aren’t Seawall related, that are free, and that are fascinating. 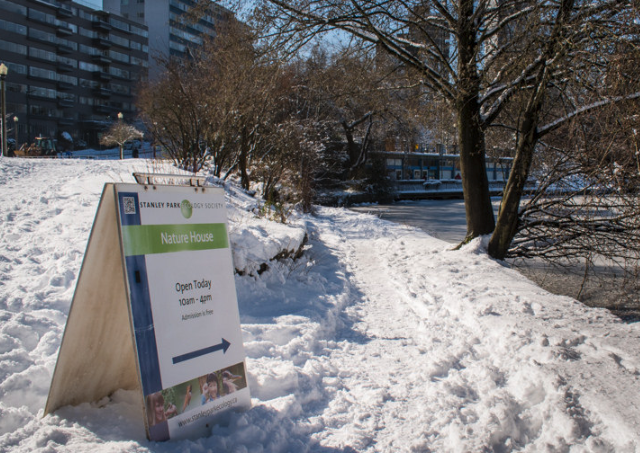 Heading into the park from the West End, at the western end of Alberni Street, walk down to Lost Lagoon and you’ll find Vancouver’s only ecology centre. The Stanley Park Nature House, operated by the Stanley Park Ecology Society, is located in the old boathouse along the water in Lost Lagoon. Admission is free to the public and hours are 10:00am to 4:00pm (weekends only September to June), and 10:00am to 5:00pm (Tuesdays through Sundays in July and August). Learn about volunteer programs, day camps, conservation efforts, and the flora and fauna in the park. 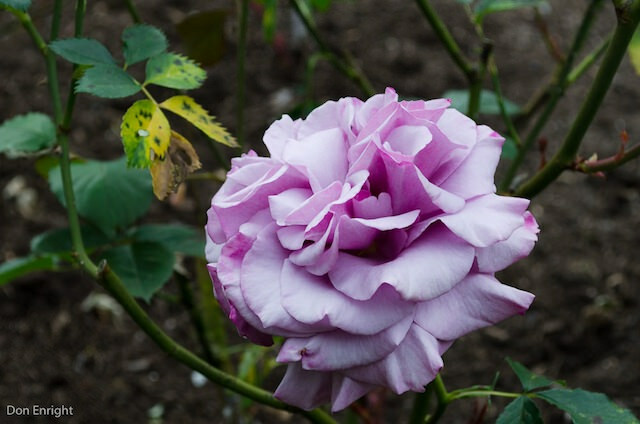 Follow West Georgia or Lost Lagoon up to Pipeline Road off of which you’ll find the most beautifully delicate and fragrant floral gardens in the summertime. John and I love the Rose Garden. 3,000 blossoming, colourful plants fill a lovingly landscaped space in the heart of the park. Before spring hits, there’s a cherry blossom canopy where you’ll find great photo ops and also couple or two posing on their wedding day with the natural pink confetti. 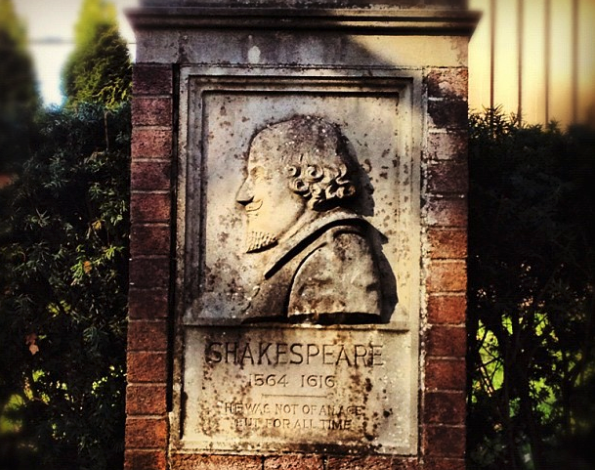 If it’s not blossom season, walk over to the north west side of Pipeline Road and along the northern border of the garden you’ll find a tribute to William Shakespeare. There’s a stone monument as well as 45 that are living. The collection of trees planted on this side are designated from the works of Shakespeare have been affixed with plaques that display their appropriate quotes. 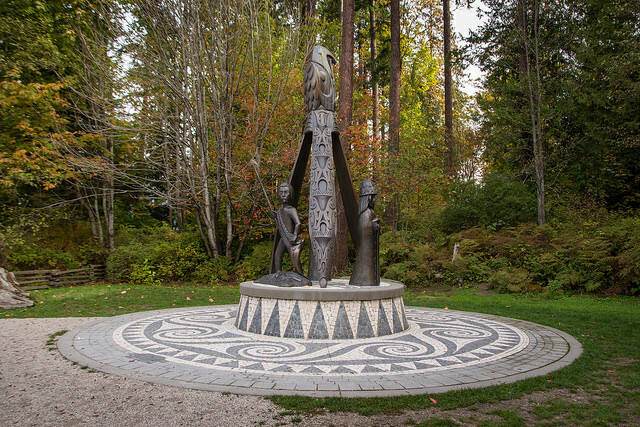 Unveiled in 2015, Shore to Shore, by Coast Salish master carver Ts’uts’umutl Luke Marston, was also the first sculpture depicting historical female figures in a Vancouver park. It’s a tribute to Portuguese adventurer Joe Silvey (“Portuguese Joe”). He was born and raised on Portugal’s Altantic Azores Islands, though after several adventures, Joe found himself on the Pacific, and an early pioneer of Vancouver’s Gastown. Find it by going to the very eastern end of the Totem Poles parking lot. You’ll find it on the north side of the lot, just back into the trees a few steps. 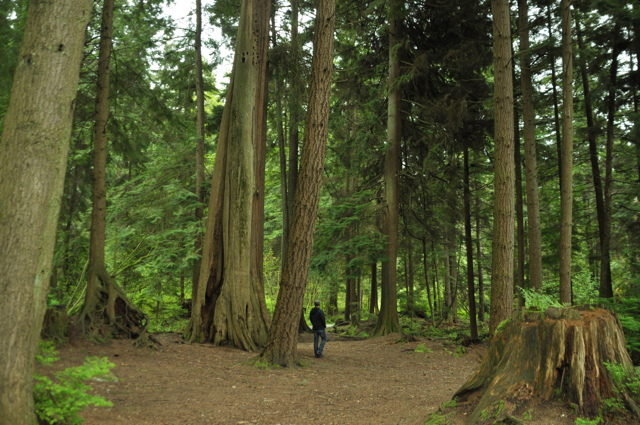 There are over 20km of trails in Stanley Park and one of my favourites is Lovers Walk. It runs between the Teahouse and gets you almost all the way across the causeway overpass before turning into the Lake Trail. Lovers isn’t a main trail that we take all the time but it’s a nice, wide connecting route with nurse logs, towering cedars, huckleberries, and no sound of traffic from the causeway piercing through like it does on some other forest paths. If you go, look up and try to find two tress that look like they’re in an embrace. They’re my favourites. Take the Merilees Trail the next time you’re coming back from Prospect Point (perhaps after enjoying a craft beer with fish & chips in the cafe). It offers an elevated view of the coast, far above the Seawall, with panoramic lookouts and photo ops of Slhx̱i7lsh, the north shore, and more. The Seven Sisters of Stanley Park are commemorated with a plaque along the Cathedral Trail, which was also named for the cluster of towering trees. 100 years ago, they were the most popular attraction in Stanley Park since the group of Douglas Firs and Western Red Cedars all grew so tall together. They were cut down in the 1950s and now only some stumps remain, but the area has been so protected after their demise that it’s still an impressive grove that is growing and expanding every year. That’s more than 5, and I could go on, but I think this list of cultural and natural attractions will give you a nice itinerary the next time you’re in the park. There are so many more important and interesting sites, so you know I’ll do a follow up post in the near future. Now, get out and enjoy your park!